Adjusting to a tubed pump was easier than expected. Caleb loves his OmniPod, has been a user for more than ten years, and only entertained the thought of a tubed pump because it is the only closed-loop option currently attainable. One of the drags of a tubed pump is having to have it on you at all times. Surprisingly, floating in the bed at night works out better than storing it in a pocket, or clipping it to his PJs. Keeping it in his pocket during the day is easy enough once he figured out what to do with the tubing while wearing a button-down dress shirt. Placement during activity is harder to manage. 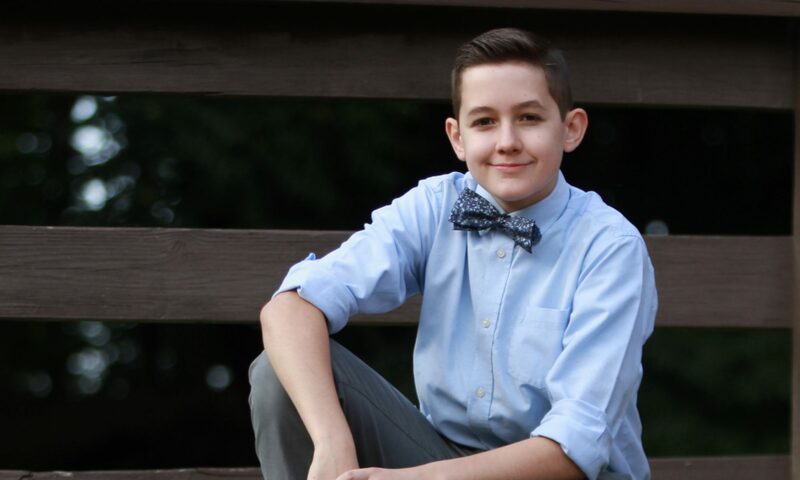 Caleb dances competitively, is an avid biker and plays baseball. These all proved to be awkward with a tubed pump. Also, for Loop to work, his phone and Riley Link need to be on him (or at least in close range of him). We used a SpiBelt daily wth the Dexcom Seven Plus system. That was a perfect size to store the receiver that had to be close to him in order to stay in range. The SpiBelt is a good solution for the pump, but doesn’t provide enough room for everything else. (Note, we did not try the multi pocket versions of SpiBelt). Caleb has used a FlipBelt which works better because it can hold everything and keep it pretty secure against him. He likes the zipper compartment for security. StashBandz is a product I hadn’t heard of until I received an offer to trial it for free. We were sent two black StashBandz Running belts, one extra small and one small. Caleb, my daughter, Lila and myself have all used them. Lila uses it to store her phone while running so she can listen to music. I’ve used it as an extra pocket while out and about and to store my phone and keys while biking. Caleb uses it to store his pump, Riley Link, phone and carbs while biking and to hold his pump while playing baseball. When it’s empty, it’s a snug piece of fabric that rests nicely around your hips. The added width of the belt seems to add to its security in placement. It’s comfortable and barely noticeable. When it has a smaller cell phone in it, it’s kept snug to your body with no noticeable movement while walking, running or biking. My larger cell phone was a little awkward because the larger flat surface has less of an opportunity to hug your body’s curves. Stashbandz still kept it snug and secure, it’s just not visually appealing to have this large rectangular bump sticking out of you. It fits me best when it’s around my hips. If higher, I don’t find it as comfortable and it has too much movement and folds over. As far as I can see that’s not how it’s intended to be worn anyway. We’ve found Stashbanz to be a good option for stashing our stuff while on the go. I do REALLY like it, and I want more, and there are hints more may be coming! Do you follow diaTribe®? If you do not, I highly recommend it. 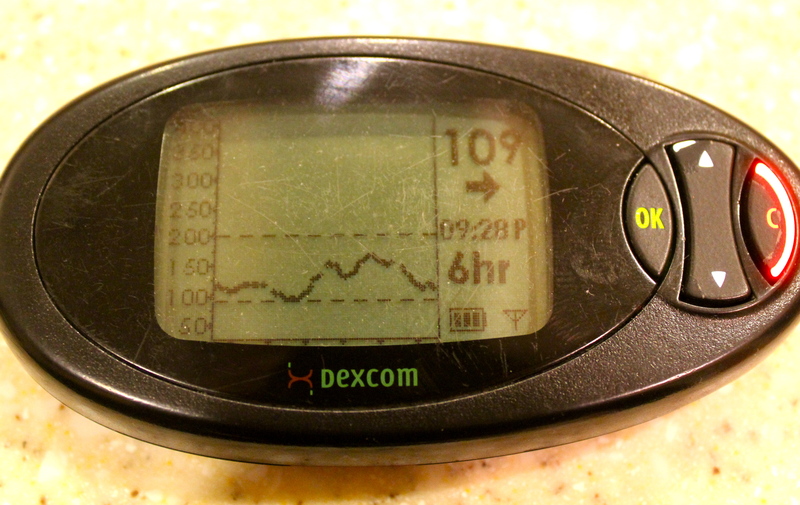 I read about DexCom Share from diaTribe® today. 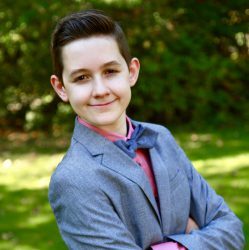 Caleb has been using DexCom G4 for over five months. He used the Seven Plus system for three years prior to the G4. The G4 is a remarkable improvement. The accuracy is significantly better. There are times that we confirm a DexCom reading with a fingerstick hoping that DexCom will be wrong, as it often was with the Seven Plus, but it never is. Okay, maybe once since Caleb’s been using it, it was off. True story. No joke. The range – OH THE RANGE! It is unbelievable. Everything is different with the range. As the caregiver, the controls are now in my hands, where they should be. This allows Caleb a little freedom not to have to think about his BG constantly or have me constantly asking him what DexCom says, (as used to be the case, evidenced by this video). Although not at the top of the list, the color screen makes the whole experience more pleasant. Dexcom is also working on a new remote monitoring product, Dexcom Share. The product is a cradle that holds the G4 Platinum receiver and plugs into a power outlet at a user’s bedside. Data from the G4 Platinum are then sent via the cradle (using Bluetooth) to a nearby smartphone. That phone then uploads the data to a web-based platform, where it can be monitored by parents or caregivers on their own cellphones. I’m the main caregiver to Caleb (aside from himself, of course). I’m on overnight duty. Traveling stresses me out. This will change that – completely! Sleepovers. Need I say more? Progress – we are moving in the right direction. In January, DexCom’s CEO spoke of DexCom’s Gen 5 which he was using at the time – the transmitter speaks with mobile devices (without the cradle) and texts alerts to caregivers. Are you drooling like I am? DexCom Share seems like a fantastic intermediary step which makes me feel like the Gen 5 is within our reach. Speaking of DexCom’s CEO, Terry Gregg, he will be on TuDiabetes Live chat this Thursday (tomorrow). It had been well over a year that I had been inquiring of Caleb’s endo about Apidra®. I consistently got two responses: (1) it’s the same as the other fast acting insulins and (2) there’s nothing wrong with Caleb’s management, so don’t mess with it. I wasn’t convinced about point one, but I did accept point two. Change plus diabetes often equates to hell on earth and I wasn’t too interested in inviting that in. I wasn’t trying to change Caleb’s numbers, so buying into “if it ain’t broke don’t fix it” seemed reasonable. But the problem is, it is broken. His pancreas is broken and achieving acceptable blood sugars with a broken pancreas is a lot of work and I’ll take all the help I can get. My gut told me Apidra® would help Caleb and after talking to a number of users, I firmly dug my heels in and instead of asking for an opinion, I simply asked for a sample. Our Apidra® journey started a couple of months ago and so far I am enjoying the ride. 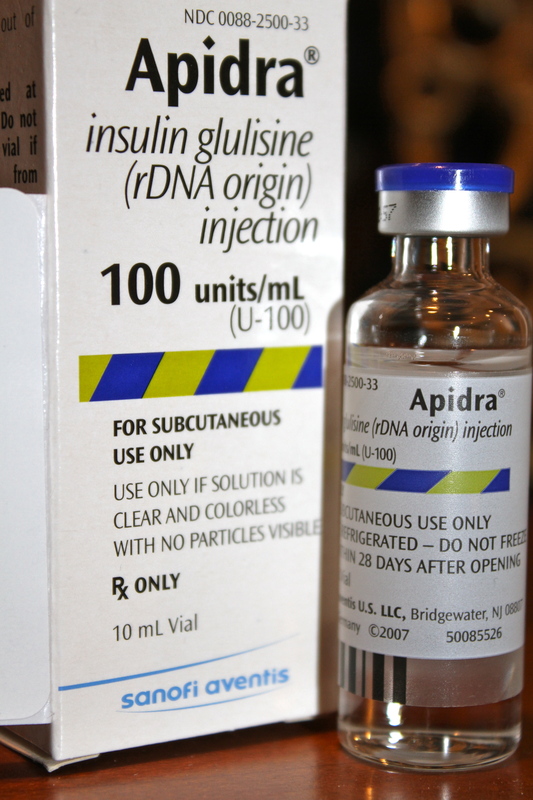 My sole reason for wanting Apidra® was to minimize the tail of insulin duration. If I could minimize tail-chasing, I would be more than satisfied. I cannot point to statistical specifics about how things have changed. I just feel like it’s better. The changes have been subtle. But subtly better. Caleb’s school nurse thinks it’s fantastic. She, more than me, sees a marked change in Caleb’s numbers. I don’t talk to Caleb’s school nurse much anymore. Caleb’s plan dictates that she call me with anything under 70 or over 200. We’ve gone more than two weeks without a call regarding blood sugars. TWO ENTIRE WEEKS! If we previously had gone two days without talking, I considered that a great success. Caleb has fewer lows and I don’t find myself tail-chasing quite so much. But this is what sealed the deal for me. We recently went to NYC to see Wintuk and went out to eat afterward. I totally guessed at his carbs. My guess was 140 in total. One hundred and forty carbs. All at once. Caleb’s meals are typically fifty to eighty carbs. One hundred and forty is almost certain to be a very bumpy ride at best. 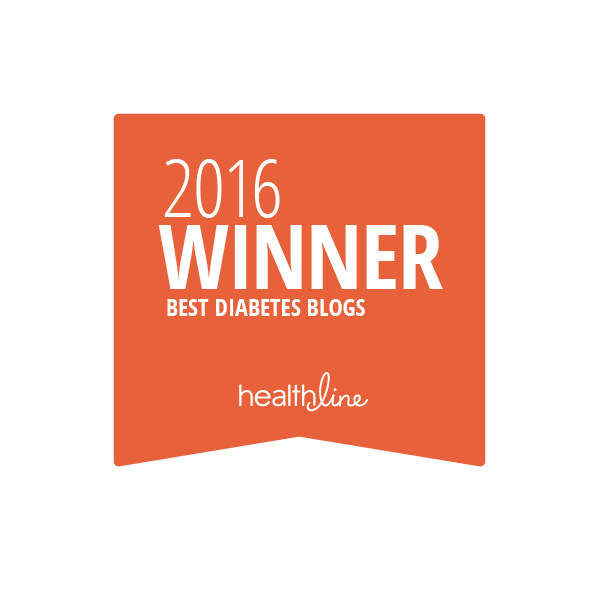 Consistency works with diabetes and doubling a meal bolus usually does not. His blood sugar pre-meal was a nifty 105, it did not exceed 158 and there was no tail to chase afterward – he ended at a flat 109. There was no big spike from the enormous amount of carbs he took in and no plummeting low afterward from a huge tail of insulin from a huge bolus. Caleb has indulged similarly on other occasions and it was never this straight-forward. Perhaps the planets were aligned this night and they will never be again. But my gut tells me that Apidra® is helping with Caleb’s D management. 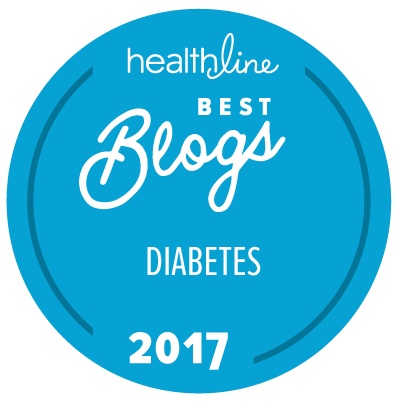 I’ve found myself many times balancing Caleb’s OmniPod case on my leg, having just stopped in the middle of the grocery story, the amusement park, the baseball field – you name it – to check a blood sugar right then and there with no place else to rest it. The PDM does not fit in the space meant for it when it has the skin on and well the skin is made to protect it, but it’s not all that protected when it’s just resting on the clear plastic/elastic strap that’s meant to keep it safe but no longer can. Are you feeling my quandry? We’ve been using a new case (pictured here) for the last couple of weeks, and I’m quite pleased. I’m able to fit all of Caleb’s regular stuff in this one place. The angle of the picture doesn’t properly show it, but there’s a two inch rim around the entire section where the PDM is so nothing falls out. There’s even room to spare. 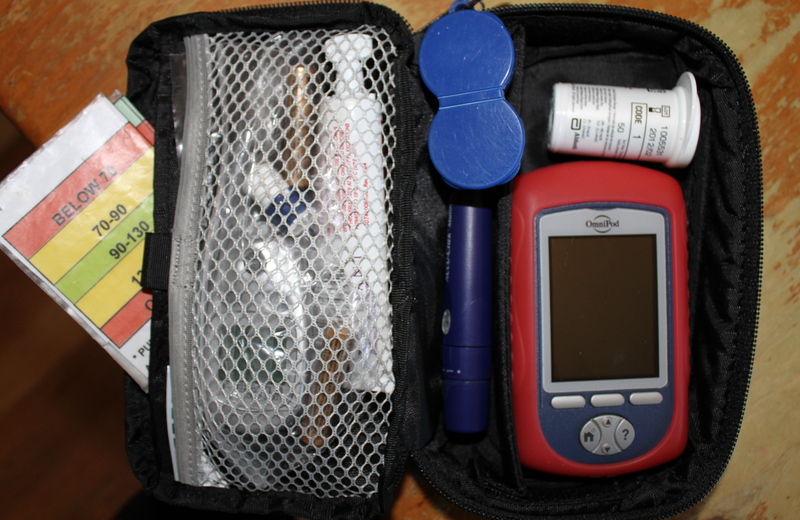 You could include an extra Pod and a vial of insulin or a small tube of glucose tabs, even a glucagon kit. Another thing you can’t see well in the picture is a movable divider between the PDM and the Multiclix. This can be removed or moved within the case to tailor to what you need to pack. This is the case that goes wherever Caleb goes. It has all the must-haves, especially when I add the glucose keychain on the zipper pull. It’s neat and tidy. At first I felt a little vulnerable without those elastic straps holding each piece in its proper place, but I’ve found the rim on this case precludes that need. Nothing falls out. Have I mentioned that already? 1. Color, pattern, decal, colored zipper – something with color. Anything with color. 2. A zipper compartment would be great for the small things. I put all those little things in a snack sized ziplock bag and tucked that in the mesh pocket that closes with a velcro patch. It’s slightly more cumbersome to access, but I rarely need those things in there, so it’s not a problem. 3. A less slippery fabric or some rubber stoppers/feet on the back of the case. It’s slippery just like all the black meter cases out there. So even though nothing falls out of it, balance and coordination are still needed to make sure the entire case doesn’t fall off my leg. If you like to keep your PDM in the carrying case when you check your sugar, this case isn’t for you because of that rim. Caleb or I always bring the PDM to his blood drop rather than bring the blood drop to the PDM, so it’s not an issue for us. Both the carrying case and the keychain are from ReliOn and are sold at Walmart. The case is $7.99 and the key chain is $1.82. 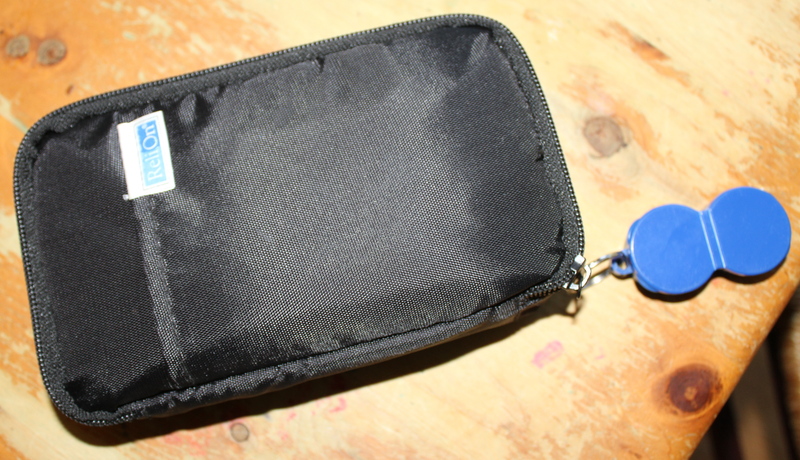 The case also comes with a nice flat cold pack if you need to keep your insulin in it. We were excited to receive a free DIDGET™ blood glucose monitoring system from Bayer HealthCare. I first heard of it about a year ago and was intrigued. 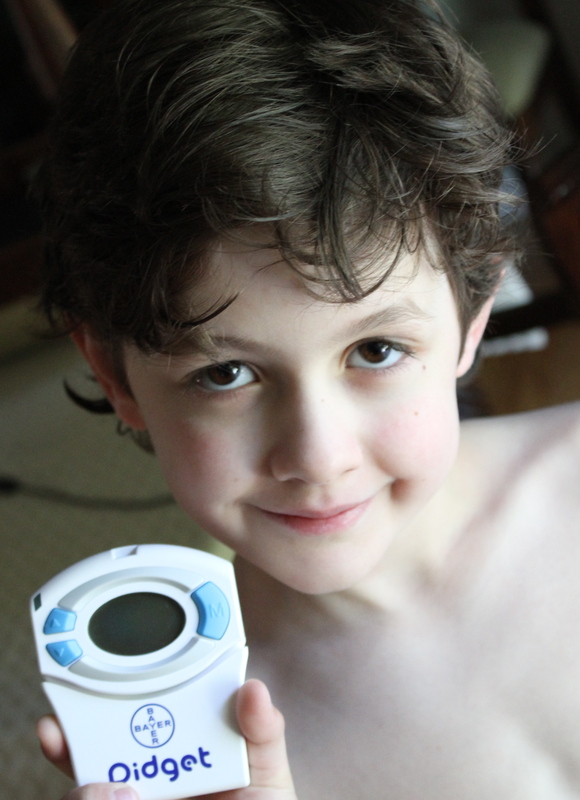 If you’ve been following Caleb you know that he received a Nintendo DS™ when he braved his first DexCom™ insertion. So with new meter, the Knock ‘Em Down World’s Fair DS game and a vial of test strips, we were ready to go. Other than the meter, game cartridge and 25 strips, neither Caleb nor I are receiving any kind of compensation from Bayer. Nor did Bayer specifically ask us to do any kind of review. For more information on Bayer’s DIDGET™, including an online demo, check out their website. If you search online for “Bayer DIDGET™ User Guide” you can get the complete instructions in PDF format. The way the system works is you use the DIDGET™ like any other BG meter to check your sugar. You then plug the DIDGET™ into your DS and start the special Knock ‘Em Down World’s Fair game. The DIDGET™ uploads all the points earned from checking your blood sugar to the DS. At this point you can remove the meter and play the game redeeming your points as you wish. 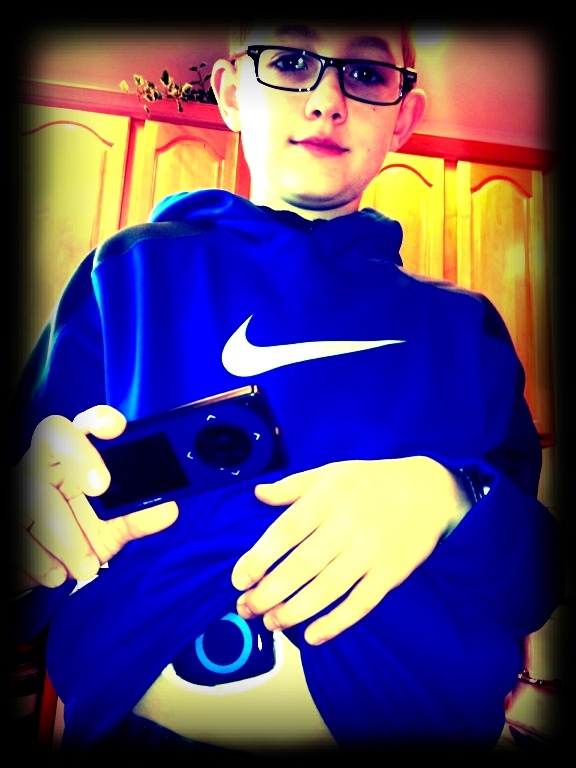 Caleb uses the OmniPod insulin management system which has an integrated Freestyle meter. Caleb checks his sugar eight to ten or more times a day without complaint. Caleb’s use of Nintendo DS™ is limited to once, maybe twice a month. He’s a busy boy and screen time is a privilege in this house that is earned and only available after all other responsibilities and activities are completed. Caleb had 25 test strips to use from which to earn “tickets” to redeem for rewards. More strips and longer use would enable a more comprehensive review. One of the first points made in the user guide is how to hold the meter when reading the blood sugar result. After personally having a mini panic attack when reading “26” on a OneTouch UltraMini that was actually a “92” held upside down, I had great appreciation for this instruction. The rewards from using the meter are largely based upon frequency of testing. You get rewards for checking your blood sugar regardless of the result. The more you check each day (up to four times) and the more consistently you do so, the greater the rewards. There is a slight increase when your blood sugar is in range, but the lion’s share relates to frequency and consistency. If you check more than 4 times a day, it doesn’t benefit you as far as rewards are concerned. The User Guide has more specifics on how the calculations are made. The game is not overly simplistic or cutesy. I expected that for some reason. It’s also not immersed in diabetes. Other than a mini game called “Flash Carb” and needing to refuel your player with snacks, I didn’t see any reference to diabetes. I think these attributes will lend to longevity of use. I was excited about the mini game Flash Carb that tests your knowledge of different food’s carb content. Estimating carbs is something we are currently working on with Caleb. But I didn’t know what kohlrabi or kasha were much less how many carbs are in them. I do think Flash Carb increases carb awareness in general, but I was hoping for something a little more practical for us. As you heard Caleb say, he enjoys the mini games and has his eyes on at least one he’d like to unlock with his rewards. There is a battling component to this game that’s a little scary (emphasis on “little”). The music is a little tense and there’s a clown figure in it that makes me a little uneasy. Caleb agrees, although plays it without fear and no nightmares have resulted. Caleb (age 7) can typically pick up a video game and figure out what to do without much (any) instruction. The battle part of this game had us a little stumped. However, older brother (age 10 who plays video games even less than Caleb) gave it a try and was much more adept. I’m concluding that the game is targeted toward an age range that includes Caleb and children several years older and that’s why he (and I) struggled a little bit with this part. Caleb was pretty excited just to watch Colin succeed at the challenges and I ultimately had to pull the game out of Colin’s hands. Overall the quality of the game is good. This is based mostly on Colin’s and Caleb’s assessments and their ranking of it up their with any of their other favorite DS games. As you heard Caleb say, he would use the separate meter to check his sugar so that he can unlock more mini games and buy more food, costumes, pictures, etc. He seemed very excited about it. Is this going to make us switch to using the DIDGET™ on a regular basis? I’m not sure. The reward system won’t change Caleb’s D management. He doesn’t need to be encouraged to check his sugar more frequently than he currently does. Having to carry around a separate meter does not appeal to me, but Caleb doesn’t seem to mind. Ideally I’d be able to split his prescription between two brands of strips – is that even possible? The DIDGET™ definitely has the potential to improve a child’s D management. But even if your child is already checking his or her blood sugar regularly, this game creates an intrinsic positive feeling about good blood glucose control. It’s something else available to kids to make them feel that living with diabetes isn’t “strange”. I find value in that. Playing Nintendo DS™ is “cool” and having a game that’s made especially for kids with diabetes, which gives only them the power to earn the rewards, either for themselves or big brother, is pretty neat. Bennet at YDMV and again at YDMV and one more time at YDMV.